Grace Roots Blog: Display a Growing in Grace Banner on your site! Display a Growing in Grace Banner on your site! 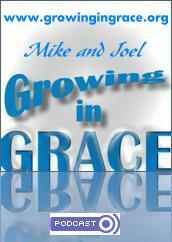 Mike and I are very thankful for all the wonderful support from friends and listeners of the Growing in Grace podcast. People are finding out about the program all the time, and many lives are being touched weekly through the message of God's unconditional love and grace. This is due in large part to people like YOU who are spreading the word! Thanks so much for telling others about the program. Here's one more way to get the word out. If you have a blog or other site on the web, feel free to add a Growing in Grace Banner to your site. It's very easy - simply choose from the banners below, and then copy and paste the HTML code that's below the banner onto your web page.